Plug the power cord in and wait until the ACT light starts flashing. Open your web browser and connect to http://192.168.88.1 if the router has been reset you will not be asked for a password and should be redirected to the quickset page. The router will reboot and then be restored to our default configuration. 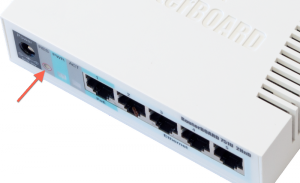 Now follow the Mikrotik Install Guide to complete the setup.